Softly disconnected and lightly amplified tresses catch the eye in this smoldering casual look. 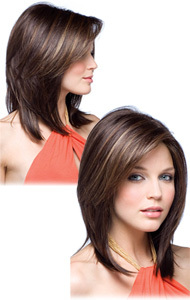 Feathery, out-flipped layers lend a "retro" finish to this shoulder length cut. • Overall Length: 15 in. An irresistible yet playful feminine design.